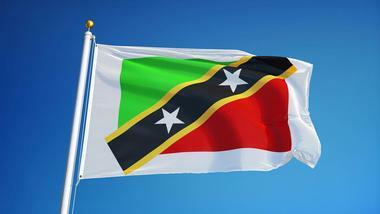 St. Kitts and Nevis is a small Caribbean island country in the Caribbean Sea, located between Antigua and St. Maarten. Its lush landscape is dominated in the island's center by Mount Liamuiga, a long-extinct volcano. The shoreline ranges from steep cliffs to fine white sandy Caribbean and curious black volcanic sand, while the lush rainforest is rich in tropical flora and fauna. 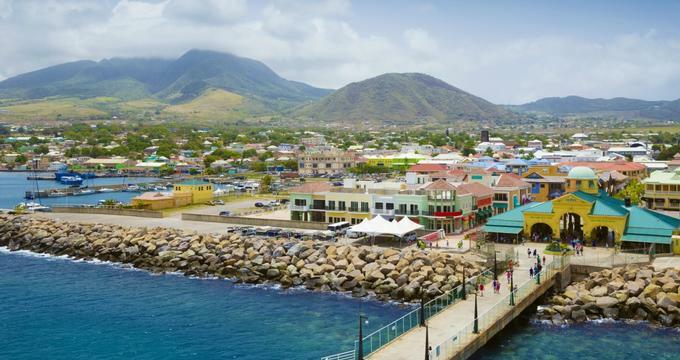 Old plantation houses, beautiful beaches, lush vegetation, and historic towns like the capital Basseterre make a visit to St. Kitts and Nevis a true delight. Brimstone Hill Fortress is a complex of fortifications located on Brimstone Hill that includes Fort George Citadel with the Fort George Museum, the Eastern Place of Arms, and the Western Place of Arms. The national park that has been created to protect the complex is a UNESCO World Heritage Site. All these wonderfully preserved fortifications and buildings can be accessed by climbing a very steep path with a series of steps and ramps. 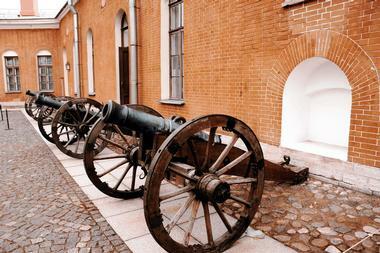 The fortress was designed by British military engineers, and is a testimony to their engineering skills. It was built and maintained by African slaves, so it is also a testimony to their endurance and strength. St Kitts, world famous for its blue seas and fine sandy beaches, is also well known for its verdant central mountain chain, which rises to almost 4,000 feet and is almost completely covered by thriving rainforest. 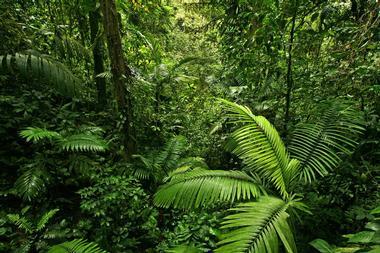 All land above 1,000 feet was declared a national forest reserve in order to protect most of the island's rainforest. 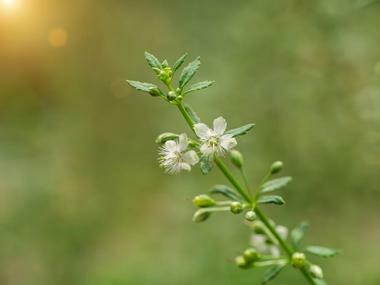 The area is classified by scientists as an American Oceanic Rainforest, one of the rarest kinds of forests on the planet, and it is expanding instead of shrinking, as it is in most the world. There are many trails that wind through the lush forests under the canopy of ancient trees, full of flowers and the sounds of the wildlife that thrives in this spectacular world. Located at the foot of the lush Olivees Mountain, Fairview Great House is a beautifully restored French colonial mansion set on over 2 acres of gorgeous tropical garden. The house was built in 1701 and is open to the visitors in all its glory – with period furniture and décor that include a magnificent 16-seat mahogany dinner table laid with china and silver. The docents who accompany visitors will explain that the chaises were made wider in order to accommodate petticoats. The veranda off the master bedroom offers breathtaking views of the Caribbean Sea, the southeast peninsula, and the island of Nevis. Outside the main building, across the courtyard, is the original kitchen, a bathing room, and a fieldstone cellar that is now used as a gift shop. The gardens surrounding the mansion are magnificent, full of lush tropical greenery, flowers, birds, and monkeys. Museum of Nevis History is a small museum located in a beautiful Georgian-style building in Charleston with a range of historic artifacts, displaying charts and other objects that depict the history of the island. The building, known as Hamilton House, houses the museum on the first floor, while the second floor has the Nevis House of Assembly meeting room. The charming stone building was built in 1680, destroyed in an earthquake in 1840, and restored in 1983. The building is better known as the birthplace of American statesman, soldier, lawyer, first Secretary of the Treasury, and founding father Alexander Hamilton, who was born in 1757. Hamilton lived on St Kitts until the age of nine. A short trip from Charlestown and its luxury resorts will take you to the glorious, lushly tropical Nevis Botanical Garden, located against the looming shadow of Mount Nevis. 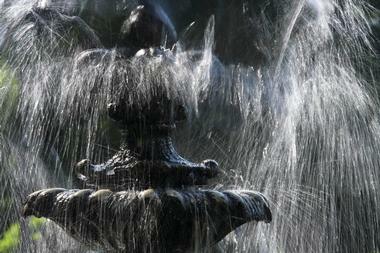 The gardens' property originally belonged to the Montpelier Estates. The 5-acre gardens include a huge variety of tropical plants from all over the tropical world, a cool cascade, dolphin fountains, and a pool with water lilies. 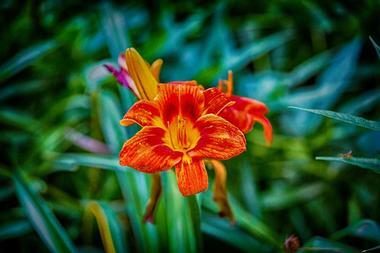 Enjoy spectacular flowering royal poinciana, the national flower of St. Kitts and Nevis. The shaded Orchid Terraces are home to many colorful bromeliads, exotic orchids, and more than 100 species of palms. The Tropical Vine Garden will delight you with the fabric-like flowers of the calico vine and the heady fragrance of the stephanotis. Explore the ruins of a lost temple in the mysterious Rainforest Conservatory. Romney Manor is the former downtown Basseterre residence of the Wingfield Estate sugar plantation owners. Since 1964, the manor has been taken over by the Caribelle Batik store and workshop and is one of the favorite tourist stops in town. The Caribelle staff show the visitors the process of making batik and also sell their beautiful products, from clothes to gifts and accessories. The garden around the former manor is a horticulturists' delight, with a 350-year-old raintree as the centerpiece and a bell tower that was used to monitor working slaves. The view of the entire garden from the viewing gallery is breathtaking. Located in the eastern part of Basseterre near Newtown, Independence Square, or Pall Mall Square as it was previously known, was given its new name on 19th September 1983 to celebrate the birthday of the nation of St. Christopher and Nevis. Only a few of original houses that existed around the square remain, such as the public library and the court house. Originally, the land on which the square sits today was a pasture, then a slave market, where slaves sold their produce and met with each other, then it became a parade ground and a place for the militia to practice its drills. In 1855 the Commissioners for the Supply of Water started the improvements in Pall Mall Square, including building a beautiful fountain surrounded by flowering plants. The square became a popular place to live and many famous people have resided here, including Doris Wall, Sir Maurice Davis, and Professor Bryan King. Today, the square is a popular venue for cultural events and locals and tourists enjoy sitting under the trees. Park Hyatt Hotel St. Kitts is a world-class Caribbean resort located along the shores of beautiful Banana Bay, overlooking The Narrows, which separates St. Kitts from its nearby volcanic island neighbor Nevis. The resort, which was opened to the public in November of 2017, offers 126 luxury guest rooms and suites, which blend colonial and contemporary design elements crafted from locally-sourced materials. In-room amenities include walk-in rain showers, deep soaking tubs, and private balconies, with suites with private infinity pools and wellness areas available. Five-star dining experiences include the ocean-to-table restaurant Fisherman's Village, the adults-only Stone Barn, and the colonial-style Great House, which features a rum bar and chef's table. Guests can also utilize the resort's 1,750-square-foot fitness center and state-of-the-art luxury spa, which offers panoramic views of Mount Nevis. 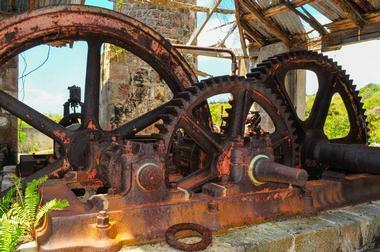 Located at the edge of the town of Cayon, Spooner's Estate is in many ways the story of St. Kitts and its industry as it has changed over time. Originally, the property was owned by the French Captain Paul De Brissac who, like everyone else at the time, processed sugar cane. He built a large boiling house, a mill, and a still. John Spooner acquired the property in 1720 and, after many different owners, it was purchased by Wade and Abbott, who in 1901 converted the existing sugar factory into a cotton ginnery, as by that time sugar had stopped returning its usual high profits. The ginnery operated until 1975, when it was purchased by the government. Today the estate has the original structure and the only cotton ginnery still standing, and offers beautiful views of the surrounding land. 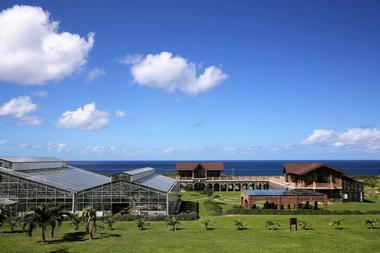 St. Kitts Eco-Park is Taiwan-funded greenhouse and garden complex in the town of Sandy Point, which has the goal of teaching young local people about sustainable agriculture and horticulture. All the structures are built with glass fiber-reinforced concrete, which is five times harder and three times lighter than normal concrete. The greenhouse is 24 meters tall and spreads over 14,000 square feet, making it the largest greenhouse in the Caribbean. It contains large number of plants, including local medicinal herbs, butterfly orchids, and roses. 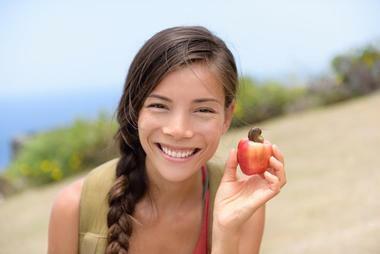 There is a large number of tropical fruit trees, and the fruits are sold to the local population. The Eco-Park has an interesting maze made of plants that is shaped like the maps of St. Kitts and Taiwan. No wonder the local call the park "Little Taiwan." If you don't have much time and want to see as much of St. Kitts as possible in total comfort, you should board the St. Kitts Scenic Railway. 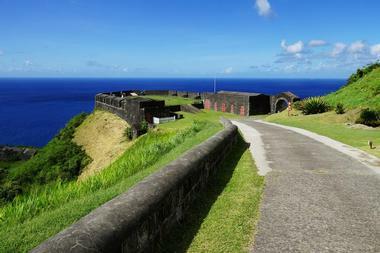 This unique railway line will take you on a 3-hour trip along the coast of St Kitts on a narrow gauge track of 762 mm. This unique and beautiful trip makes a 30-mile-long circle around the island, hugging the northeastern coastline, offering spectacular vistas of the Caribbean as well as beaches, surf, steep cliffs, and lush vegetation. The train slowly runs along tall steel bridges across deep canyons, through small villages and farms, and through lush, mysterious green rainforests bordered by miles of sugar cane, with the looming shadow of the Mount Liamuiga volcanic cone. The Circus is a circular road junction located in the heart of Basseterre and was created after the "Great Fire," which destroyed much of town in 1867. In the new layout, Liverpool Row and Fort Street were widened to make sure that the traffic could move faster in case of another fire, and also to prevent the fast spreading of flames. In time, the Circus was decorated with the ornate clock in its center called the Berkeley Memorial, in honor of Thomas Berkeley Hardtman Berkeley, a local legislator and estate owner. 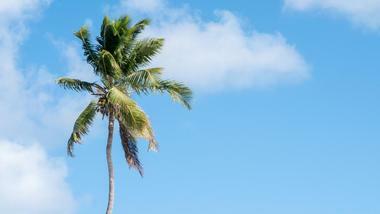 Palm trees were planted around the inner square, which was eventually paved, and many of the earlier planted trees were destroyed by numerous hurricanes over time. The Circus was said to have been designed to resemble Piccadilly Circus in London. Four main streets lead from the Circus in the direction of the compass points, and the Circus is a hub of city activity, especially during numerous carnivals and other festivals. The National Museum of St. Kitts and Nevis is located in the former Treasury Building. The building used to be located on the Basseterre Bay front, on what is now the land between Basseterre and Port Zante, which has been reclaimed and is now the new gateway into Basseterre, where cruise ships dock today. 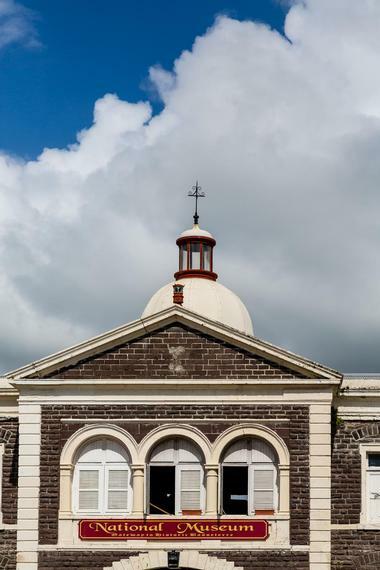 This venerable old building made from hand-hewn volcanic limestone was built in 1894 and is a great place to learn more about St. Kitts' history, culture, and colonial past. There are three galleries with exhibits that tell the story of the country's heritage, its indigenous inhabitants, sugar plantations, slavery, the rum trade, carnival customs, rebellion and, finally, independence. There are some very colorful traditional costumes on display. Warner Park Sporting Complex is the St. Kitts' main athletic facility. Located in Basseterre, the complex includes the Warner Park Stadium, famous for hosting the 2007 Cricket World Cup, including a cricket pitch, pavilion, modern media center, and seating for 4,000 fans, with temporary stands that can accommodate up to 10,000 people for major events. The western part of the large complex has a football stadium that can seat up to 3,500 spectators. The northern section has three tennis courts, three volleyball courts, the Len Harris Cricket Academy, and Carnival City, a small open field used mostly for various carnival events. There is so much to enjoy in St. Kitts, but the best way to learn about the place and its people is by learning about what they eat, cook, and drink. St. Kitts Food Tours specializes in combining the exploration of the island landscape with its favorite treats, taverns, markets, beach bars, and small local eateries. Some tours, like the Food & City Tour of Basseterre, invite tourists to experience Kittitian local foods, Basseterre, views of Port Zante, and the mountains. There is also the Chocolate & Rum Tour, St Kitts Chocolate Factory Tour, St Kitts Taste and Views Island Tour, and many others. You can choose a walking tour or hop aboard one of their open vehicles. The tours usually take about 2 hours and often end on the beach to cool off and get ready for dinner. Located in Crab Hill, Sandy Point, about 11 miles from Basseterre on St. Kitts and just around the corner from the Brimstone Hill Fortress, is the Lighthouse Baptist Church, which houses the Amazing Grace Experience Visitor Center. This museum tells the story of John Newton and his journey from the "great blasphemer", slave trader, and ship's captain to the writer of the words for the legendary song Amazing Grace. The visitors center describes how John Newton's words to Amazing Grace became known around the world, how the song influenced the abolishment of slavery, and how it is connected to the beautiful island of St. Kitts. The visit is emotional and educational and leaves a lasting impression on visitors. 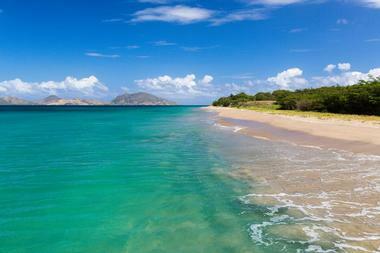 St. Kitts is surrounded by crystal-clear water and beautiful sandy beaches and is cooled by a pleasant breeze. For some visitors, lying on a lounger on the beach or strolling through the narrow streets of Basseterre is just fine, but there are always daredevils and adrenaline junkies who can take the opportunity to try some extreme sports, such as kitesurfing, paragliding, flyboarding, or stand-up paddleboarding. 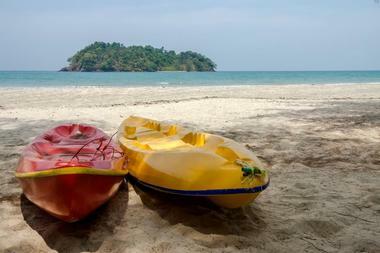 That is where the Beach Addiction watersports company comes in. Its owner and boat captain Nick promises lot of fun in total safety. Together with his qualified instructors, he will take you from the lovely sandy beaches in their boat to fulfill your dreams and get your adrenaline flowing. Beach Addiction in St. Kitts is located in the St. Kitts Marriott Resort in Frigate Bay. 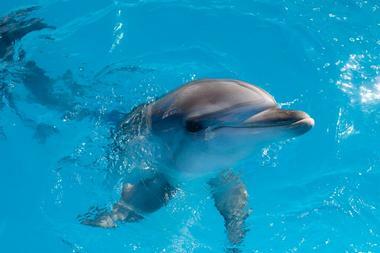 One of many pleasures you can enjoy during your stay in St. Kitts is swimming with dolphins. Dolphin Swim Adventure offers you an opportunity to immerse yourself in the clear tropical waters and have a closer look at dolphins in their natural environment, not in a pool or aquarium. You will be able to interact with these intelligent mammals, let them snuggle with you, and watch them show off with awesome acrobatics. They will also push you across the water, in what is popularly called "the bootie push." An added attraction is the Swim Adventure, in which you hold on to a dolphin's fin while it swims across the water, far faster than you could by yourself. While you are interacting with dolphins, the Swim Adventure experts will tell you more about the life and biology of these fascinating animals. 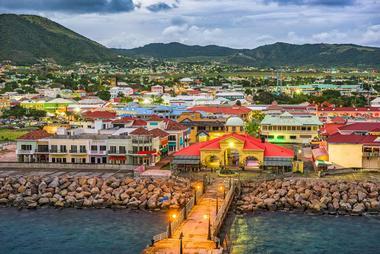 St Kitts is small but there is so much to do, you do not want to miss anything. You need experts to make sure you check out the best spots in as much ease and comfort as possible. 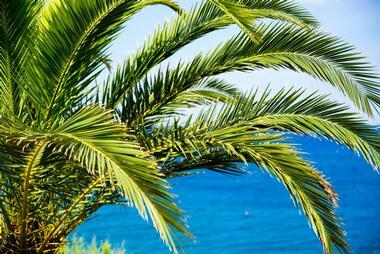 Let Island Paradise Tours to the work, driving included. They will pick you up at the airport or at your cruise ship and take you on one of their fun, informative, and educational tours. You may opt for the Cruise and Snorkel Tour aboard their lovely sail boat along the beautiful, scenic coast; snorkeling is included. Or you can go on the Scenic Drive and Sightseeing Tour aboard a large airconditioned bus, cruise along the coast, visit sugar cane fields, or pass by mountain ranges and majestic historic plantations. Or visit the capital Basseterre, take the Rainforest Tour, the Volcanic Hike Tour, the Capital and Beach Tour, and many others. The memories you will take with you will be priceless. Located in Old Road Town, Sky Safari Tours offers an unique perspective on the spectacular nature of St. Kitts. This zip line adventure tour company will show you the surrounding rainforest from a very different perspective – above the canopy, the way birds see it. 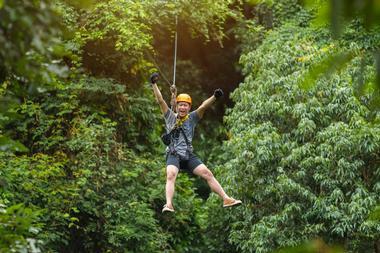 From one of the Sky Safari's five zip lines, which range in length and level of difficulty, with the longest stretching 1,350 feet, you will get a panoramic vista of the different trees that comprise the lush rainforest jungle. You will also be able to see the surrounding historic sites and neighboring islands while flying through the sky at up to 80 kilometers per hour. Each line is located strategically to give riders the opportunity to see a different view. The whole zip line system is state of the art and the experience is, while breathtaking, completely safe. Cottle Church is a small Anglican church north of Charlestown, built in 1824 by John Cottle, then a plantation owner and the President of Nevis. He wanted the church to serve as a place of worship for whites and slaves together. Unfortunately, it was illegal at the time for slaves to worship, so the church was never consecrated and was abandoned after John Cottle died. 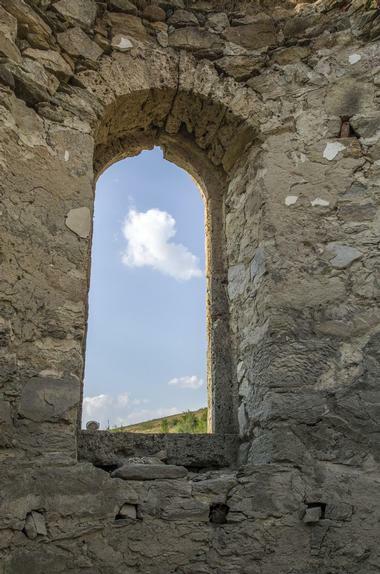 The ruins of the church, hidden in the forest, are today a tourist destination and a popular venue for weddings, although there is no much left but the outside walls, which do, however, provide an interesting glimpse into the history of the island.